Welcome to the first-ever nerds of a feather giveaway! 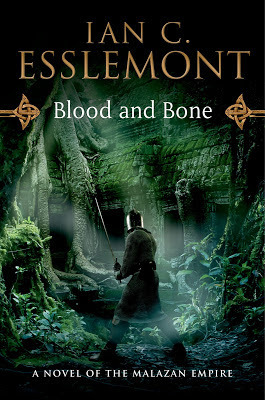 The grand prize is your own personal copy of Ian Esslemont's Malazan novel Blood and Bone, a book we recently reviewed. "In the western sky the bright emerald banner of the Visitor descends like a portent of annihilation. On the continent of Jacuruku, the Thaumaturgs have mounted yet another expedition to tame the neighboring wild jungle. Yet this is no normal wilderness. It is called Himatan, and it is said to be half of the spirit realm and half of the earth. And it is said to be ruled by a powerful entity whom some name the Queen of Witches, and some a goddess: the ancient Ardata. To the south, the desert tribes are united by the arrival of a foreign warleader, a veteran commander in battered ashen mail whom his men call the Grey Ghost. This warleader takes the tribes on a raid like none other, deep into the heart of Thaumaturg lands. Meanwhile word comes to K'azz, and mercenary company the Crimson Guard, of a contract in Jacuruku. And their employer...none other than Ardata herself. Ian Esslemont thrills again with another gripping entry into the New York Times bestselling Malazan World in Blood and Bone." This giveaway is open to anyone with a US or Canadian shipping address. The giveaway ends at 11:59pm PT on June 17, 2013. We will announce the winner later that day. Keep in mind that, as this is the first time we're doing this, technical difficulties may arise. Please be patient and we'll try to sort them out as quickly as possible!